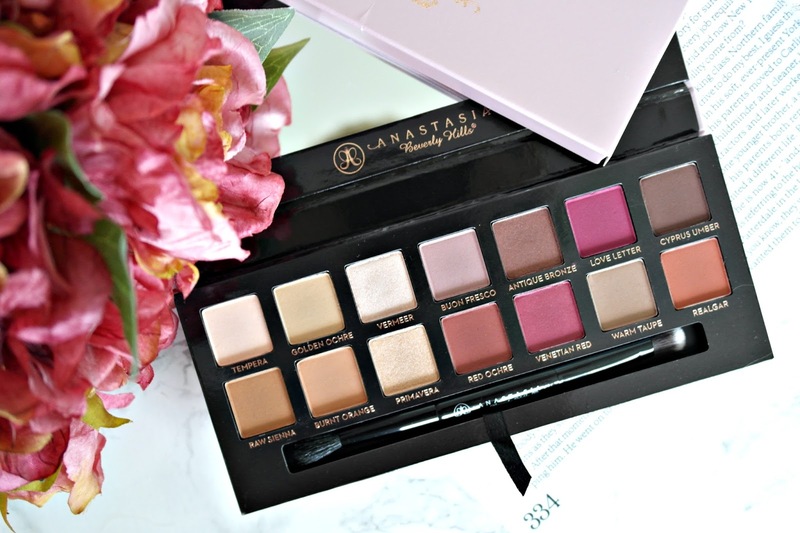 Anastasia Beverly Hills has been established as one of my all time favourite makeup brands since I fell in love with their eye shadows, liquid lipsticks and brow definer. Their products in my eyes are faultless, and with their makeup range forever increasing, my love for them is only due to grow with it. So when I woke up on Tuesday morning and received an email about a new ABH product; the Modern Renaissance palette I didn’t even hesitate picking up my card. Before I knew it I had manged to buy it within 5 minutes of waking – I hadn’t even left my bed. Good start to the day in my eyes. 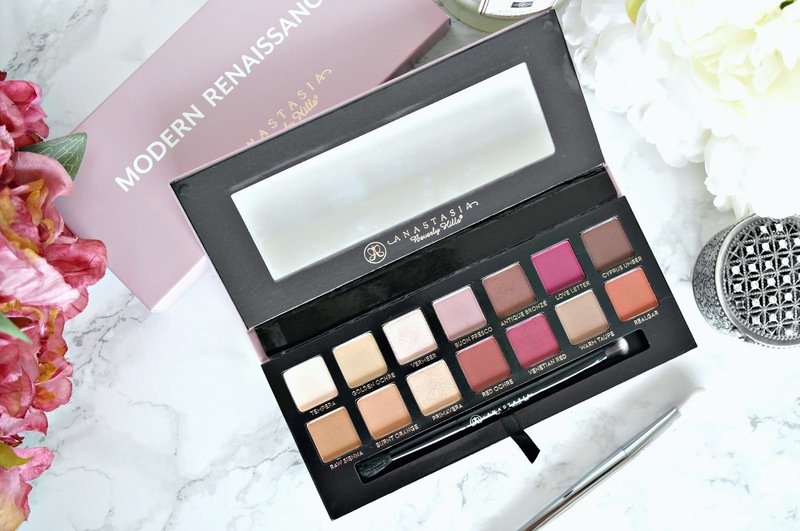 The Anastasia Beverly Hills Modern Renaissance palette comes in a pretty dusky pink case which has a velvety textured front. As pleasant as it looks it’s not at all practical when it comes to coloured powder being near it. So much so, that when I took the palette out of the box there was a small speck of eye shadow on the front which has left a mark 🙁 It’s only tiny and unnoticeable to most, but I like things to be perfect when I have just bought them. I ummed and arred over to whether to send it back to Cult Beauty but then I realised that its just going to get mucky as I use it anyway, so I might as well roll with it…. The Modern Renaissance Palette consists of 14 warm shades – 11 matte and 3 shimmer. The mattes are all described as ultra matte (due to their high pigmentation) which for me is perfect as I much prefer matte eye shadows over shimmers or metallic. As an added benefit it also comes with a quality double ended brush which I think is good considering you don’t get that with many other palettes. I was immediately drawn to this palette as it has such an unusual collection of shades and I would never normally choose bright pink shades for eye shadows. However don’t let this put you off – after trying these pinks I am in love with them. If you have blue eyes like me, they will really make your eyes pop and I can’t wait to try a dramatic smokey pink eye look with them as the colours are so intense. There is a beautiful combination of every day colours like Tempera, Golden Ochre and Raw Sienna, together with bolder and brighter colours that you might use for a more dramatic look, such as Cyprus Umber, Love Letter, Venetian Red and Antique Bronze. 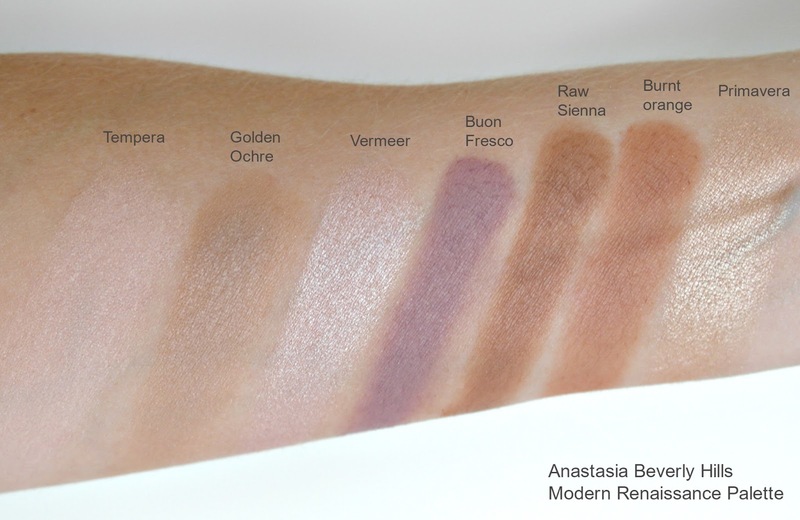 Once again the pigmentation in these shadows is unreal – particularly the darker shades towards the right of the palette. They are very very creamy so you do get a fair bit of fall out when you first apply them. Just ensure you apply your eye makeup before your foundation so you don’t ruin your flawless base and you will be fine. I always use primer with eye shadows to make the colours more profound, but I have tried these without and as they are so pigmented a primer is not at all a necessity! 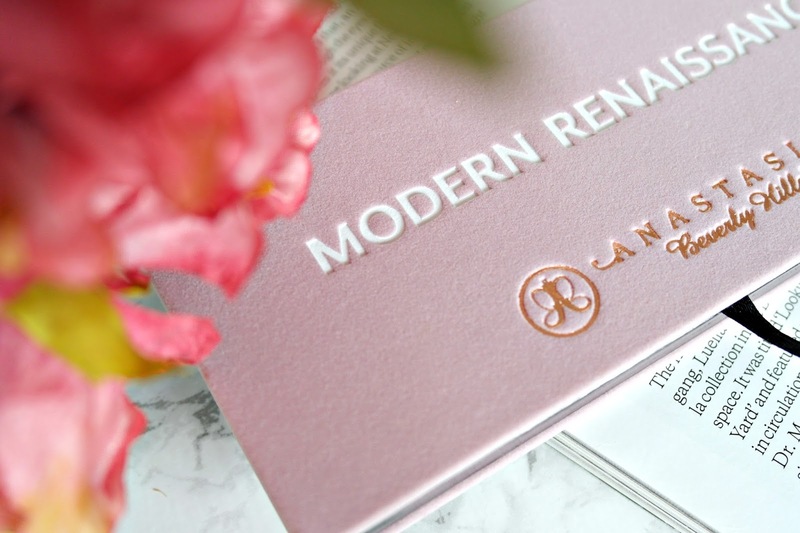 The ABH Renaissance Palette is the first ever permanent palette in the ABH collection and if you live in the UK it can be purchased on Cult Beauty or Beauty Bay for £41.00. £41.00 maybe a lot to pay for a palette but when you consider the quality of these shadows and the brush that is included I think it’s worth the price tag. A must for any makeup addict! 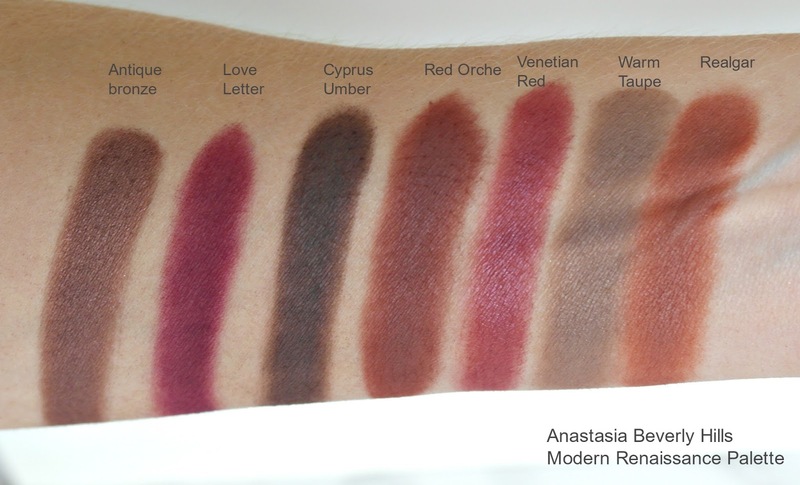 What are your thoughts on the Anastasia Beverly Hills Modern Renaissance palette?